Monterey is over and it’s taken me awhile to get things into perspective. All in all it was a good week, people came out, the shows were darn good, the races (or displays of historic race cars) were exciting as always, and the auctions were still full of excitement. But beneath it all, there may have been a feeling of forced optimism. As I said previously, the hotels were not fully booked. I talked to a local who said that while the hotels had rooms, the camp grounds and RV parks were full. The crowds were good but I suspect there were a large number of day trippers. But let me start at my beginning, Wednesday, August 12, 2009. I arrived at my friend Doug’s place mid-afternoon. Wednesday evening I went to the Peter Hay Golf Course (part of the Pebble Beach Company) for an Infiniti reception and viewing of the Infiniti G Convertible, a hardtop convertible. Nice reception, gorgeous car, and I met some interesting people. It is a good way to spend a summer eve on the Monterey Peninsula. Thursday was the day for collecting my passes and snapping some pics at the auctions. My friends Doug and Pete, and I ate at the Gallery Café at Pebble. It’s a good place to have very good food at a reasonable price. Early Thursday evening Pete and I went to the Portola Plaza Hotel for the RM Auctions of Nick Alexander’s Woody collection. The place was packed and the sales were brisk. There really is too much to do during the week. One writer I know actually had a schedule all mapped out; I decided to be a bit more casual about it. Friday there are three shows, two of which I had passes for – La Dolce Vita and Concorso Italiano. La Dolce Vita was the new kid on the block, born out of discontent with last year’s Concorso Italiano. I got the feeling that when Concorso was revived by its new owner that La Dolce was left without much reason for being, as the need for two Italian car shows is debatable. What La Dolce had though, and to my mind where they might want to focus in the future, was a nice selection of French cars. Perhaps La Dolce could become the European car show, maybe even have a display of Hotchkiss cars? Whatever, the organizers of La Dolce put on a good effort, definitely deserving of more attendees. I hope they return next year. I do have to give a big thanks to the people at La Dolce Vita for putting on a great lunch, catered by Tarpy’s, a local restaurant. Concorso Italiano, after a disastrous year at the wind tunnel called Marina Airport, staged an astounding comeback thanks to a new owner. Set on the Laguna Seca Golf Course (some of us old farts found the hilly terrain a bit daunting), they had a very good array of Italian machines, and their attendance was good. Friday evening we headed over to Carmel-By-The-Sea for dinner at Il Fornaio, an excellent place to top off a day of things Italian – good food, not too formal, just a great place to be with people you enjoy. 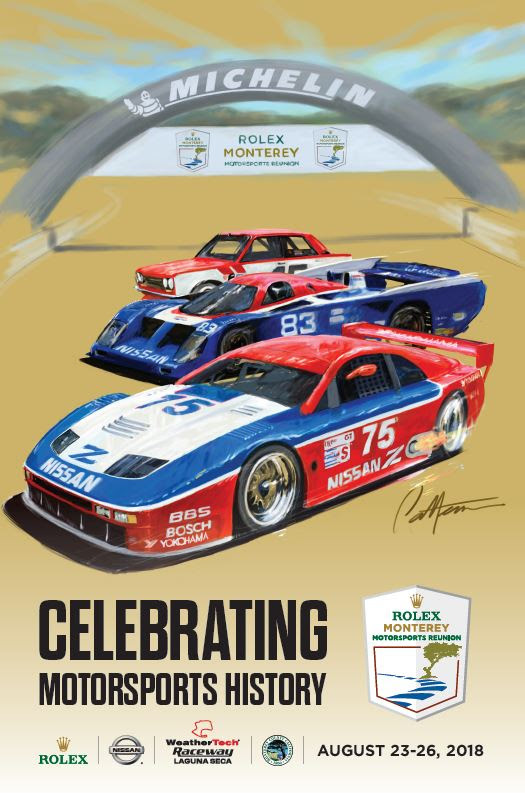 Saturday is always track day, the day for getting over to Mazda Raceway Laguna Seca for the 36th Rolex Monterey Historic Automobile Races featuring Porsche. Attendance seemed darn good, the parking lots were almost full and the hills covered with enthusiasts. We watched a few races, walked the paddock, ate a hot dog, and just had a hell of a time. Sometimes I just close my eyes and listen to the cars battle it out – it’s like going back in time. Saturday evening I went to the unveiling of the Devon Motorworks GTX in front of Club XIX at Pebble. The GTX is a 2-seat, front engine, rear-wheel-drive coupe powered by an 8.4-liter V10 that produces 650 hp. Not exactly my cup o’ tea, and definitely out of my league, but an interesting, American supercar. From Devon I walked a few yards over to the Automotive Fine Arts Society (AFAS) reception, hosted by Lincoln. Years ago automotive art was seen as a joke, an offshoot of advertising and not real “art.” Today it is considered true art and collected, thanks in part to the AFAS’ promotion of its members. I browsed the display and ended up buying a print (all I can afford alas) by Bill Neale. While standing around, just soaking up the atmosphere, an old friend, Andrew Frankl stopped by to chat. Andrew, being a man of the world, seems to know just about everyone. That evening he introduced me to Mark Fields, Executive Vice President, Ford Motor Company, and President of the Americas for Ford. I mostly listened as Andrew and Mr. Fields discussed the automotive industry – I always try to glean as much insight as possible. A little while later I introduced myself to Edsel Ford (Henry II’s son), and his son, Henry Ford III. Edsel kind of looked at me with trepidation (what the heck does this guy want?) but I was polite and congratulated Henry III on his recent stint as a salesman at Galpin Ford in L.A. Henry III is learning the family business from the ground up. As the AFAS party wound down I headed downtown to the RM Auction, stopping briefly to take in the action at Russo and Steele. The auctions did fairly well, with Mecum and Russo and Steele selling around 50% of a somewhat thin line up. 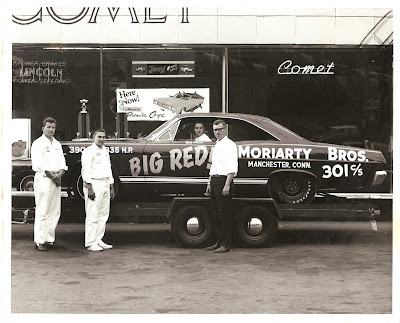 Both had decent total dollar sales though, with Mecum hitting just over $14-mil (a ’65 Cobra Daytona Coupe went for $7.25-mil), and Russo and Steele almost $5-mil. The bloom may be off muscle cars, at least for a time. The other three auctions, Bonhams & Butterfields (61% sold for $14.2-mil +), Gooding & Company (81% sold for just over $50-mil), and RM (86% sold for $35.5-mil) were more successful, showing that there is still a relatively strong market for the more traditional collector cars. RM’s results include one full night for the Nick Alexander Woody Collection and two other nights of auctions. Sunday morning Doug and I went to the Pebble Beach Concours d’Elegance, the one, true Concours on the West Coast. It truly is a display of the best of the best. Thanks to my friends at Mercedes-Benz we had front row seats, fine food and drinks, and great company while we viewed the parade of winners. I cannot say enough about Larkin Hill, who graciously allowed me to join the Mercedes-Benz suite. Mercedes is truly a class act. To everyone who puts up with us journalists during the week, thank you. For me the whole week is like being a kid in the best candy store on earth. I just wish there were more hours in the day. I don’t like to rush around any of these places; I prefer to saunter through, absorbing as much as possible. I take a lot of pictures, some with a camera, and some with my mind. If it were not for the generosity of so many people and events I would not have half the experience I do. You can access my pictures by clicking on "Bruce Hotchkiss' Photos" on the right side. Look for my article in the September 9th Pacifica Tribune, or online at www.pacificatribune.com on September 10th.